Masaya (Agenzia Fides) - "On Saturday a young man was executed, this is the right word, because he was arrested, he was helpless, but a woman police officer shot him in the chest. The young man told her: if you have the intention of killing me, then kill me, and the policewoman shot him, and the victim fell in front of the parish of San Miguel", said Fr. Edwin Román, parish priest of San Miguel Church in Masaya. The parish priest, together with the Nicaraguan Human Rights Association, managed to deal with the release of 21 residents who had been arrested and imprisoned in the police station in Masaya on the morning of last Saturday, 2 June. The new clashes between the military forces of the government against the demonstrators in the center of the city of Masaya caused a toll of five dead last Saturday - as confirmed by the Association to Agenzia Fides -. Father Roman explained that "the whole city of Masaya organized to demonstrate, so in the center of the city barricades were erected, no one slept in Masaya and the attacks began Saturday morning at six o'clock in San Miguel Park (where the church is situated, ed.) We were surrounded by riot police, two people died". The wounded were taken care of inside San Miguel church, said the priest, and added: "we do not close doors, we must help the civilian population, help these people, even with water". Eight young paramedics are taking care of the wounded". The priest states that the violence was provoked by police authorities: "Citizens were protesting civilly and peacefully without weapons, there is an excessive use of force by the police and anti-rebels", he said. At the same time, in another part of the country, similar scenes were seen: the residents of Diriá, Granada, left their homes to defend the Catholic church and the parish priest, Father Mario Jarquín, attacked by an armed group of Ortega’s followers (Turbas Sandinistas), after the church bells had rang in warning and protest against the aggression against two young men. 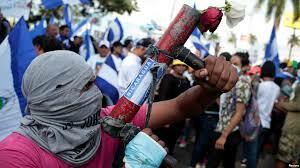 Nicaragua has been living a socio-political crisis for almost two months, the bloodiest since the '80s, which has left more than 100 dead and nearly a thousand injured, according to figures from the Nicaraguan Center for Human Rights (Cenidh). The protests against the government of Daniel Ortega began in April due to the failed social security reforms and were accentuated because of the killing of young people during the demonstrations (see Fides 4/05/2018 and 21/04/2018). The Episcopal Conference, mediator and witness, for dialogue has had to interrupt its participation in the dialogue sessions, due to the violence of the government forces.